Jurassic World 2 will parallel the treatment of modern animals! "Both Jack (Horner) and me we are concerned about man's relationship with animals. Dinosaurs are a parable of the treatment of today animals: abuse, experiments in medicine, pets, have wild animals in zoos like prisons, military use has been made of them, animals and weapons .."
Colin Trevorrow made a visit to the film festival as well, and he chimed in to detail some more details about the plot of the film. "Jurassic World health with exacerabated consumerism", he described, and then went on to say that the sequel would "shift to deal with more complex issues." Trevororrow continued. The second part of the saga will be a very different film, which will explore new directions. So it is clear that it should be Bayona who directed the sequel so that it (the direction) will be able to grow and evolve with your personal (outlook)." There is a lot of information to unpack in what Bayona and Trevorrow have decided to share. It should be noted that last week Jurassic Outpost held a podcast with Bayona and Trevorrow that declared that militarized dinosaurs would not be part of the sequel's plot. Therefore, Bayona was merely using this an an example. However, Trevorrow's comments on how Jurassic World will deal with more complex issues indicates that the latter part of Bayona's statement may hold truth for the plot of the sequel. We have already seen in Jurassic World the usage of dinosaurs in zoos,and so this leaves the first two comments,that of the usage of dinosaurs in scientific experimentation as well as how they may be treated. Given that Henry Wu apparently survived the events of Jurassic World with many embryos in tow, the door is left open for dinosaurs to be exploited in this manner. 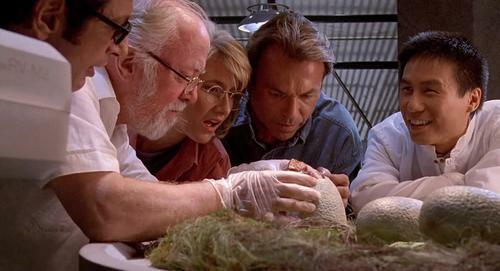 In the second film, it appears as well that Bayona will challenge our personal outlook on dinosaurs as well. Will humans begin to take dinosaurs for granted and start to use them for experimentation? This does have precedent in the Jurassic Park Novels, as Biosyn's original plan in the novels were to steal dinosaur embryos so that they could test medical treatments and therapies on them without fear of legal repercussions. In addition, it also opens the door to dinosaurs being exploited for human gain in the corporate world. Check out the article below, as the interview continues on, and Bayona does have some more intriguing tidbits to share. What do you think of his comments? Jurassic World 2 will be released on June 22, 2018. Bryce Dallas Howard and Chris Pratt will return to play Claire Dearing and Owen Grady in the film. The movie will be directed by Juan Antonio Bayona, who has directed 'The Impossible. Source:El Mundo via Jurassic Park Saga on twitter! Fan responses to Jurassic World 2 will parallel the treatment of modern animals!